Patent pending SDS 'Secure Dumbbell System' combines one-piece cast heads with steel inserts, pinned, press fitted, and welded. 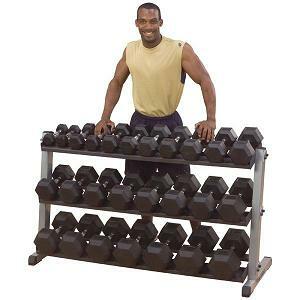 Their compact design makes them shorter in length and easier to handle than conventional dumbbells. Durable rubber coating prevents damage to floors and equipment. Available 5-50, 55-75 or 80-100 lb. sets. The Body Solid® Rubber Hex 55-75 lbs Dumbbell Set features unbeatable durability. The Body Solid® Rubber Hex 55-75 lbs Dumbbell Set is solid cast iron dumbbells that resist cracking and fading. The six-sided design prevents rolling and the rubber casing protects floors and equipment. Dumbbells are inexpensive, versatile and easy-to-use weights that let you create a variety of workouts to improve your health. Depending on the amount of weight you use, number of repetitions you do and pace at which you use them, dumbbells can help you improve cardiovascular fitness, burn calories, build muscle or increase muscular endurance for sports. Dumbbells are small weights, shaped like a Roman letter I, resembling mini, single-piece barbells. You can purchase dumbbells in different weights, starting with lightweight versions -- less than five pounds -- to use during aerobic workouts or while using a treadmill or exercise bike. Heavier dumbbells let you bodybuild. You can build muscle with dumbbells using heavier weights. Increasing muscle mass helps burn more calories throughout the day, since a pound of muscle burns more calories than a pound of fat. The Centers for Disease Control recommends combining resistance training that builds muscles with cardio exercises. You can bodybuild with dumbbells or just tone muscle. 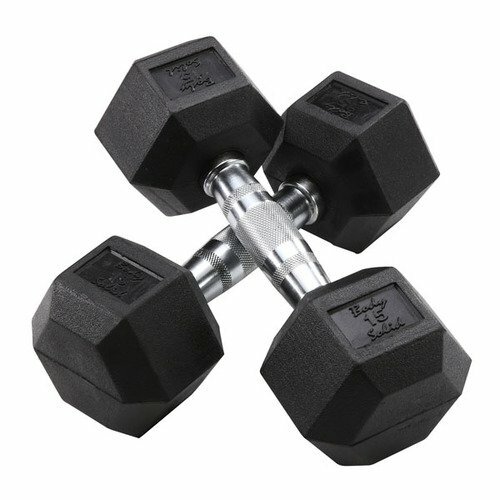 Order your Body-Solid 55-75 lb Rubber Hex Dumbbell Set from FitnessZone.com today!